It’s Cook the Book Friday again! Have I said how much I’m enjoying this book? Out of the recipes we’ve cooked from David Lebovitz’s My Paris Kitchen over the past 8 months, the proportion of winners has been astounding. My favorite thing about the recipes is that they are an excellent jumping off point for other variations. I went wild with the dukkah. I’ve made the oven-roasted tomatoes from the crostinis multiple times this summer to top quiches. 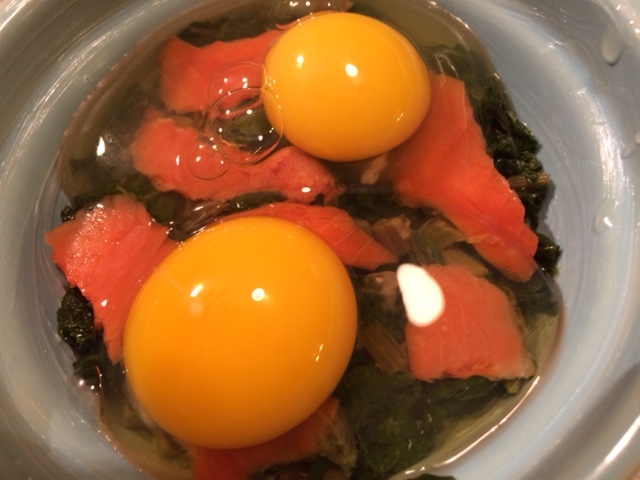 This week’s recipe, Baked Eggs with Greens and Salmon, is destined to be the blueprint for a dish that works for breakfast, lunch, or dinner. The formula starts by layering individual baking dishes with a bed of sautéed greens. The recipe called for kale, but I used the cooked beet greens I had in the fridge. Next comes a layer of smoked salmon, then the eggs. I made this with two eggs when I had it for lunch and again dinner, but it also works with just one for breakfast. 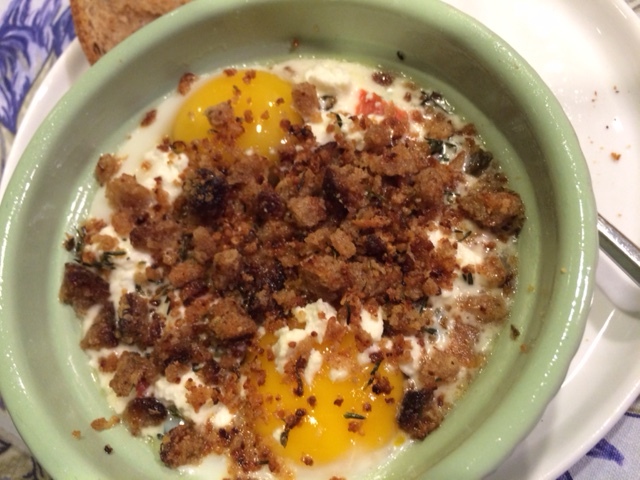 The eggs are topped with some crumbled cheese (I used feta), a dose of cream and the most delicious garlicky breadcrumbs. This concoction is baked until the whites set. For me, this took much longer than the called for 10-12 minutes, even 15 minutes wasn’t quite enough. I am starting to believe that David’s 350 oven is more like my 375 (though I have calibrated recently, and my oven should be accurate). Hopefully I remember next time we bake one of his recipes to hike the temperature. My favorite part of this recipe was the breadcrumbs. 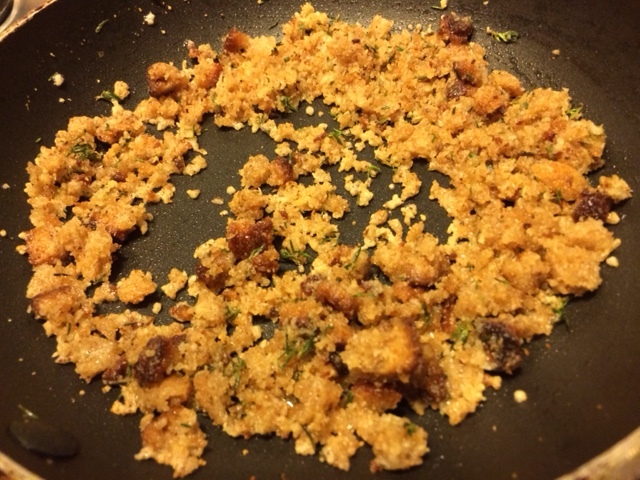 I don’t know how the butter and garlic transformed the breadcrumbs into something that tasted somewhat like bacon, a little bit smoky and a little bit meaty, but it did. I can’t wait to make another batch and sprinkle them on EVERYTHING! You should try this yourself. It’s delicious for any meal. Made in individual bakers, it works if you’re alone, or scales if you have people to share with. You can find the recipe on page 151 of My Paris Kitchen by David Lebovitz. To see what my friends’ thought of the eggs, you can follow their links here. Crisps, also known as Crumbles in places where crisps are potato chips, are among my household’s favorite desserts. I give them a mix-and-match approach, choosing the fruit based on season and the topping based on mood. There’s an infinite number of combinations. I never considered the possibility of a SAVORY crumble. However, this week’s recipe choice for Cook the Book Fridays is exactly that. 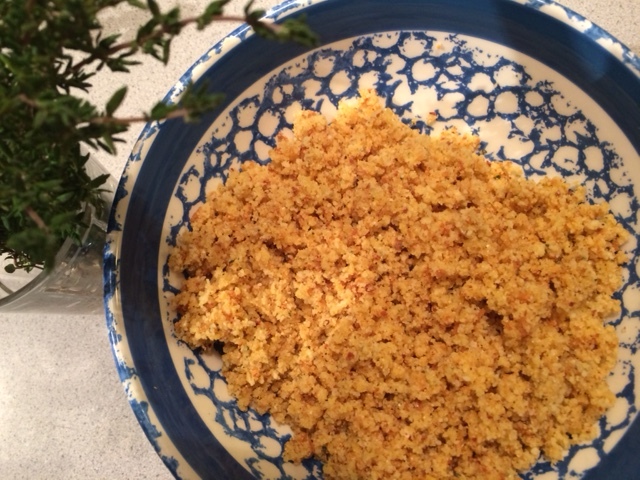 David Lebovitz presents a recipe for Butternut Squash Crumble in his book My Paris Kitchen. I was very intrigued. This is the perfect recipe for the season. Local butternut squash has just started to be harvested around here. All the fresh ingredients were part of this week’s CSA share, farmers’ market purchases, or growing in my backdoor herb garden. Delightful! To create this savory side, first you cook the squash. 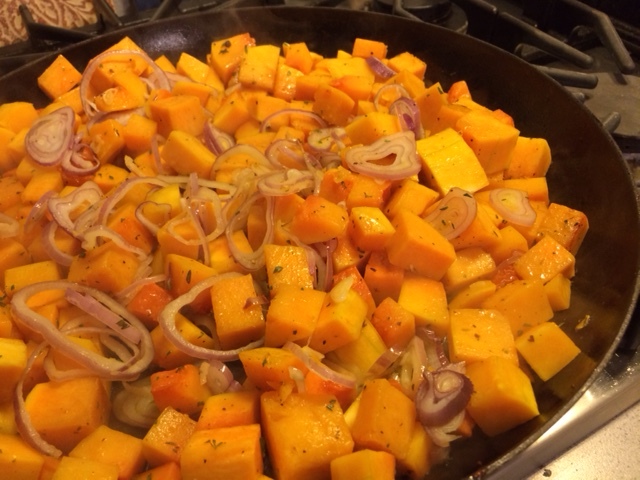 Diced squash is sautéed with shallots and seasoned with a generous amount of fresh thyme leaves until the squash starts to soften. Then the squash is further roasted in the oven. While the squash bakes, the flavorful topping is prepared. Bread crumbs, stone-ground cornmeal, and grated Parmesan cheese stand in for the flour you’d find in a sweet version. The butter is cut in until it’s crumbly. At this point, the topping had a familiar texture, but the addition of an egg ensures that it stays bound together. The crumble is sprinkled on top of the tender squash and baked some more to crisp up and brown the topping. 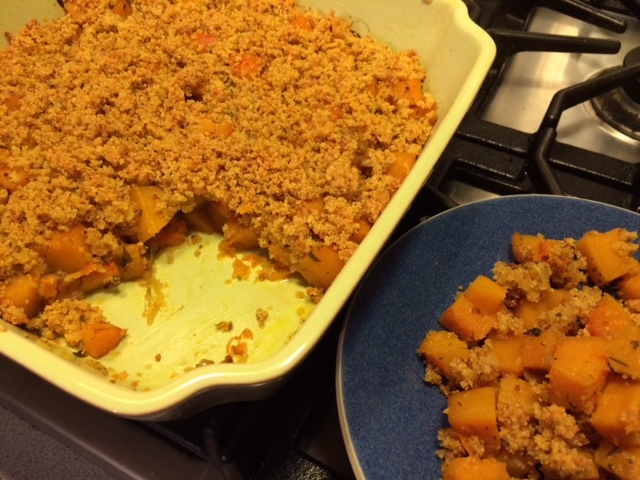 Well, the verdict is that butternut squash crumble is delicious! The tender squash and the crunchy topping works well together. My only quibble is that the two-step cooking of the squash seems fussy. When I make this again, I’ll either saute the squash until it’s completely tender OR roast the vegetable mixture until tender. I’ll skip the other step. As is, the crumble screams “Serve me for Thanksgiving, please!” Variations on the crumble will also be in the cards. I’m imagining that roasted root vegetables, singularly or as a medley, are worth a try. Different herbs in the topping could be extended for a mix-and-match for savory crumbles to complement my dessert combos. If you want to try this, you can find the recipe on page 215 in My Paris Kitchen. 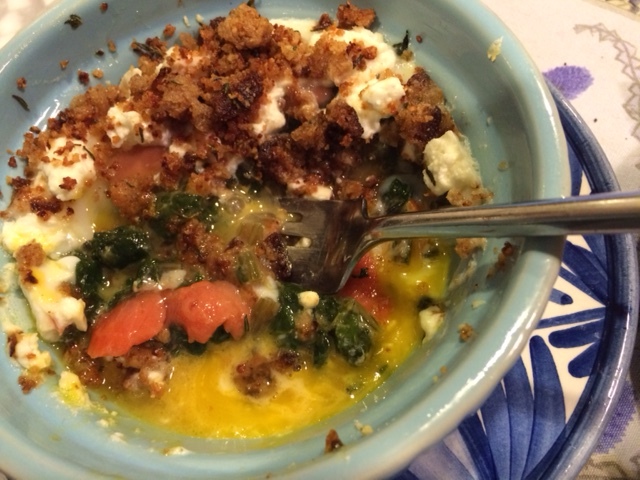 To see what the other Cook the Book Fridays members thought of savory crumble, check out their links here. And a very Happy Thanksgiving to my Canadian friends!